There are certain wardrobe staples that no woman can really live without – one of those is a midi skirt. The midi skirt can be worn in so many different ways. It can really carry a lot of styling and accessorizing, so it’s time to experiment with shirts, sweaters and long cardigans. This outfit is a perfect choice for holiday glam. You can’t go wrong with red and black, right? This red skirt has enough color and volume to stand out on its own. Just match it with red lips or nails. This look is so simple yet so powerful. Luckily, it’s easy to copy! Leather skirt is every cool girl’s go-to piece. A black one is always an excellent choice. Are you edgy enough to add some leather in your life? This grey midi is classy and super lady like. Plaid scarf is always a must when the weather gets cold. It looks especially cute when paired with your midi skirt. Holiday party season is approaching, so if you still don’t know what to wear, this golden midi skirt with white blouse might be the look you’ve been searching for. This outfit will have all eyes on you (in a good way). Slip on some overknee boots and a cozy sweater, and you are ready to dash through the cold months. This look is comfortable but also fashionable. White midi skirt is perfect for rock chic or holiday chic attitude. Pair it with a cozy sweater in warm color and you’re ready to go! Stripes and leopard? 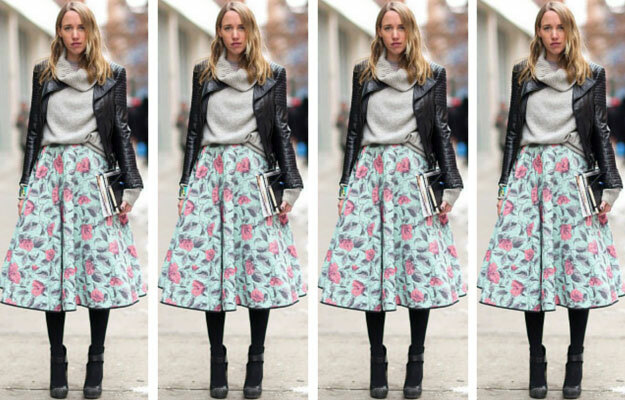 Unexpected mix of prints, especially with midi skirt but… it looks amazing! Team your midi skirt with simple T-shirt, big, warm sweater and black wedges. With key pieces and simple midi skirt, you can create endless outfits. A bodycon, midi pencil skirt is one of the hottest ways you can stay warm this winter. This look is a definition of classy woman. It’s not a secret that pastels are just as pretty in the winter. You know what would pair amazingly with your grey sweater and leather jacket? A floral midi, of course. Colorful skirts are perfect choice for those unbearable cold days when you need both warmth and motivation. When styling a patterned midi skirt, it’s best to keep your top simpler. In this way, your skirt will become a true standout. This blogger paired her midi skirt with black top and black and white scarf. Black flats or heels are delicate and chic addition to this look. We love midi skirts because of their versatility. You can combine them with flats, mules, boots, heels, and even, sneakers. If you still don’t own a midi skirt, you’re missing out!